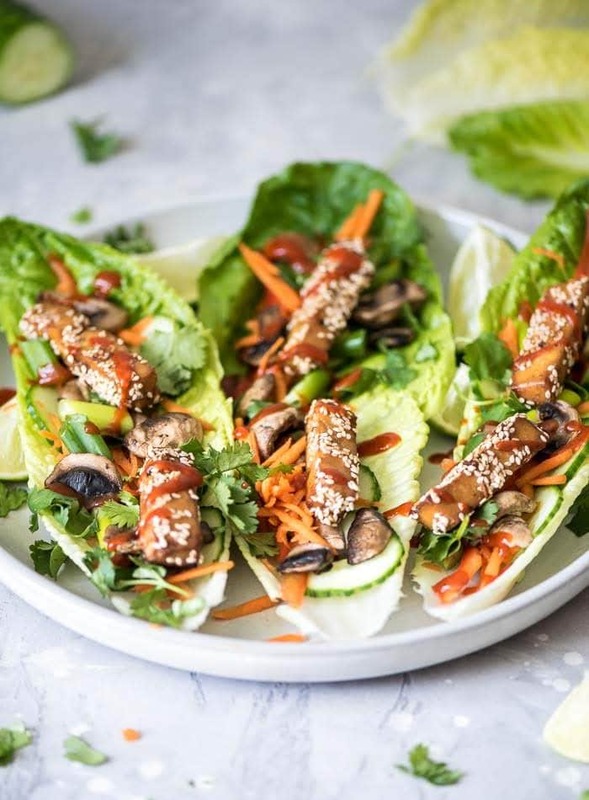 These sesame tofu lettuce wraps featured baked sesame tofu, sautéed mushroom, avocado, cucumber, carrot, green onion and sriracha. They’re easy to make, full of flavour and texture, packed with nutrition and high in protein. 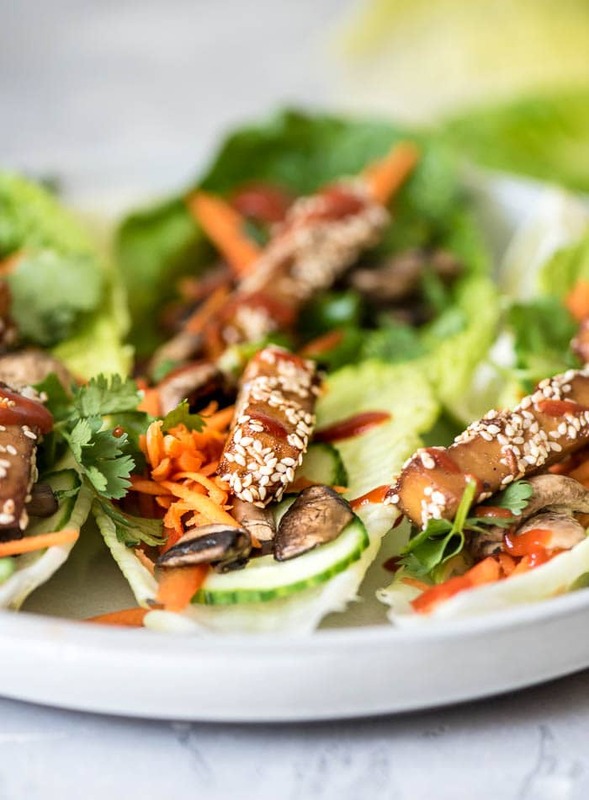 The star of this dish is the sesame tofu though, so even if you don’t make the lettuce boats, enjoy this amazing tofu with a side of your favourite peanut dipping sauce. Baked tofu is easy to make but today we’re going the extra mile with both pressing and marinating the tofu. I don’t always do this but it does result in a far more flavourful tofu than if you skipped these steps. I would highly recommend pressing the tofu for this recipe. Pressing tofu is very simple. All you need to do is take your block of tofu, wrap it with a dish cloth and place a heavy object on top of it. I use a stack of cookbooks. Let the tofu sit like that for about 30 minutes, if you leave it for longer that’s fine. Pressing the excess water out of tofu allows it to absorb more of whatever you plan to flavour it with. I went with tofu strips but you could do cubes, slaps, larger pieces or triangles. To cut it in strips, slice the tofu block in half, cut those halves into 4 layers length-wise then slice the layer into 3 strips each. You should have 24 strips when you’re done. To create that delicious baked sesame tofu result, after pressing the tofu, I’d recommend marinating it for at least 30 minutes. This step is easy. Just mix the marinade in a bowl or shallow baking pan and add the sliced tofu. I used a loaf pan. Let this sit for at least 30 minutes up to overnight, if you can, give it a shake or spoon the marinade over the tofu every 10 minutes or so. The longer it marinates, the more flavourful the final result. I marinated mine for 40 minutes and the results were excellent. After the tofu marinates in soy sauce (use tamari for a gluten-free recipe), sesame oil, maple syrup, salt, pepper and garlic powder, you’ll add a little cornstarch (or arrowroot powder) and some sesame seeds before baking it in the oven. I haven’t tried making the tofu without the cornstarch but I don’t know how much of a difference it actually made, so you can probably leave it out if you want. Alright, so you’ve pressed and marinated…now to bake. There’s not much you need to know for this step except to lay the tofu in a single layer on a baking tray, giving each piece a little space around it. Pop the tray in the oven and bake at 350 F for 30-40 minutes until golden brown, flipping once half way through. That’s it. 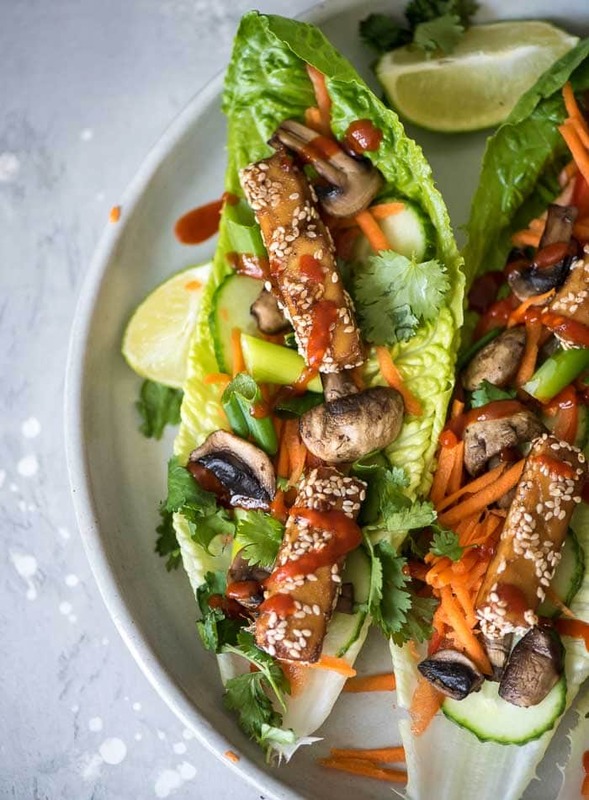 Now we’re ready to build these tofu lettuce wraps. 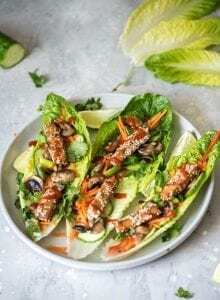 If you aren’t making the lettuce wraps and just want to enjoy this tofu as a side or snack, I’d recommend whipping up a batch of my almond pad Thai sauce, coconut peanut sauce or almond satay sauce for delicious dipping! These would all be great drizzled over the lettuce cups too. 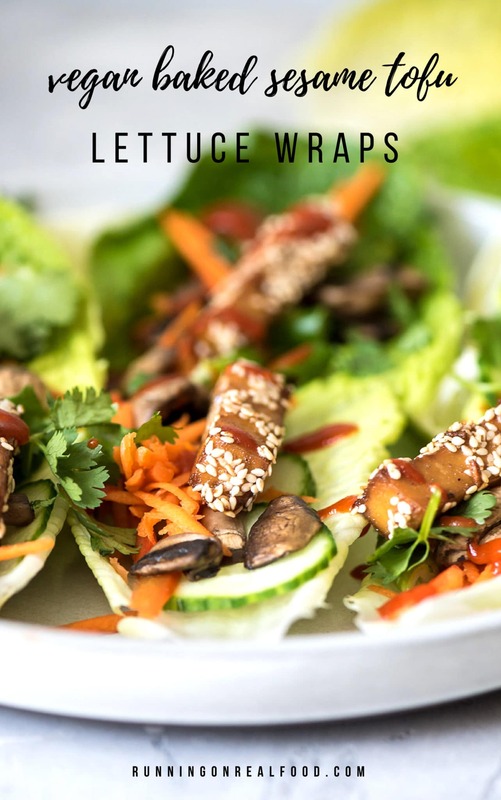 Once the tofu is baked, it’s just a matter of assembling the lettuce wraps. There are no rules to what veggies you use. I used sautéed mushrooms, grated carrot, red onion, cucumber, green onion, avocado, red pepper and sriracha. Some other good garnishes would be crushed peanuts or cashews, cilantro, grated cabbage, kimchi and lime. Have some fun with them! I would recommend using smaller cup-sized lettuce leafs than I did in the photos, those got a little messy! I used 3 large leaves but smaller ice berg lettuce cups or small romaine lettuce leaves would work better. I think adding my almond pad thai sauce or almond satay sauce next time is a must too! 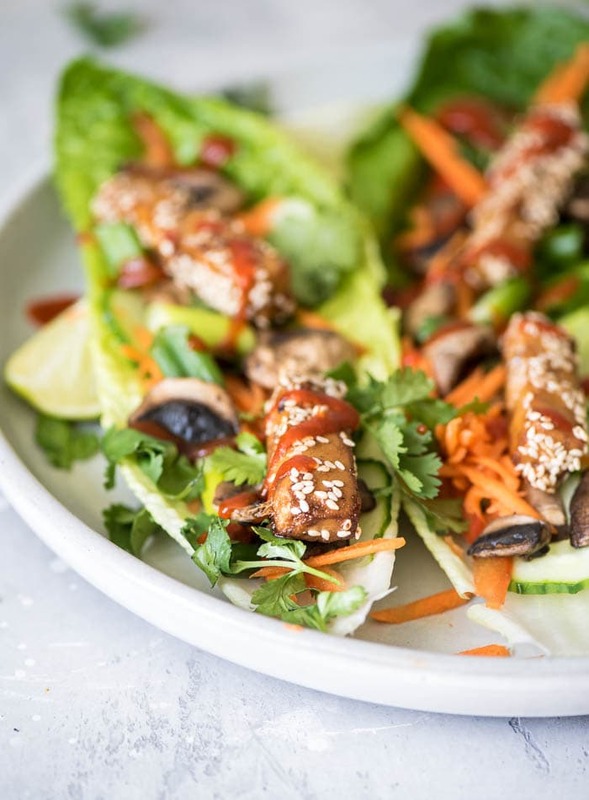 These lettuce wraps are loaded up with yummy veggies, sautéed mushrooms and crispy baked sesame tofu. Try them for a quick and easy vegan dinner. The leftovers can be tossed together to make a tofu salad or snack on the tofu with your favourite peanut sauce. To make the tofu, first wrap the block of tofu in a dish towel on a plate or baking tray and place a few heavy objects on top of it. A stack of cookbooks or cast-iron pan does the trick. Let it sit for 30-60 minutes. Whisk together the marinade ingredients in a shallow dish, loaf pan or roasting pan. Once the tofu is done pressing, cut it into strips and place the strips in the marinade. Let sit for 30-60 minutes, up to overnight. Every 10 minutes or soon, carefully stir and spoon the marinade over the tofu so all the pieces are getting coated. 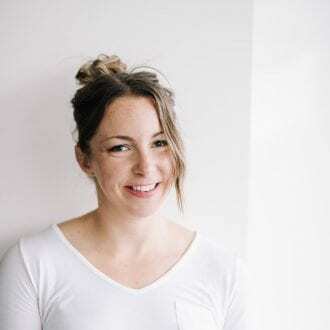 When you’re getting close to baking time, pre-heat the oven to 350 F and either line a baking try with parchment paper or spray it with some non-stick coconut oil cooking spray. 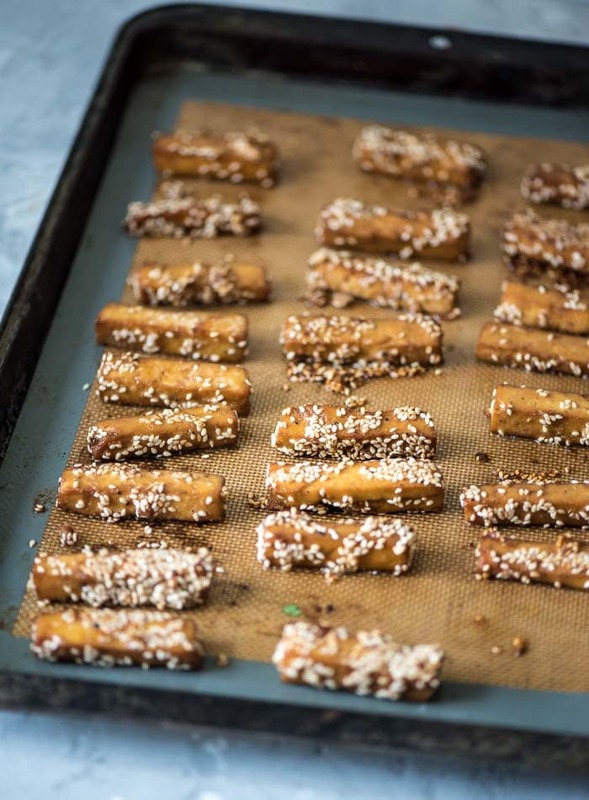 When the tofu is done marinating, mix in the cornstarch and sesame seeds then place the tofu strips on a baking sheet in a single layer. Bake for 30-40 minutes, flipping halfway through. To make the sautéed mushrooms, slice the mushrooms and add to a pan with either a quick spray of non-stick coconut oil cooking spray or a splash of water or broth. Saute until tender and browned. 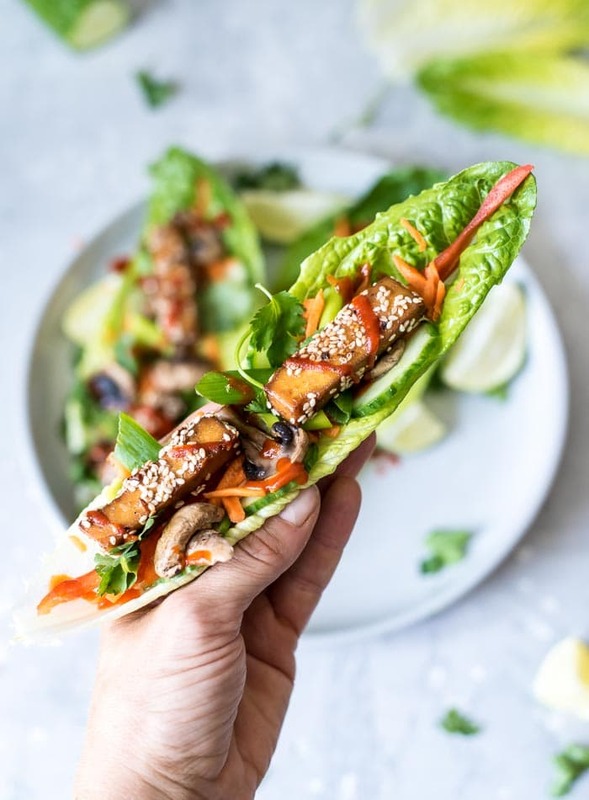 Once the tofu is done, assemble the lettuce wraps with the rest of the ingredients then add a few strips of tofu to each, drizzle with sriracha or your favourite sauce plus any other garnishes and enjoy. Yes, it’s so good!! Maybe the best tofu I’ve made. It would be really good in sandwiches sliced into slabs! I made these tonight and they are delicious!! I could have eaten the whole meal by myself lol. Thank you for this great recipe. Thanks Stephanie, I’m so glad you liked them!! I really appreciate the review!